Baccarat online is a game with three different betting options. You can bet on yourself, the dealer, or on the tie spot. The object of the game is to predict whose hand, yours or the dealers, will be closest to 9. Rival Gaming's online Baccarat shows face cards and 10's equal 0, aces are worth 1, and all other cards are worth their value. Suits don't make a difference in baccarat. If your Baccarat hand is over 10 you subtract 10 to get the baccarat value. If your value is 10 your value drops all the way to zero, you must come as close to 9 without going over. Ties here pay 9:1, while all other bets pay 2:1 unless you bet on the house and it wins. In this case the house gets 5% commission. Your balance is kept track at the bottom of the screen along with the cashier, lobby, and options tab. You can choose your speed settings from here also and play as slow or fast as you want to. 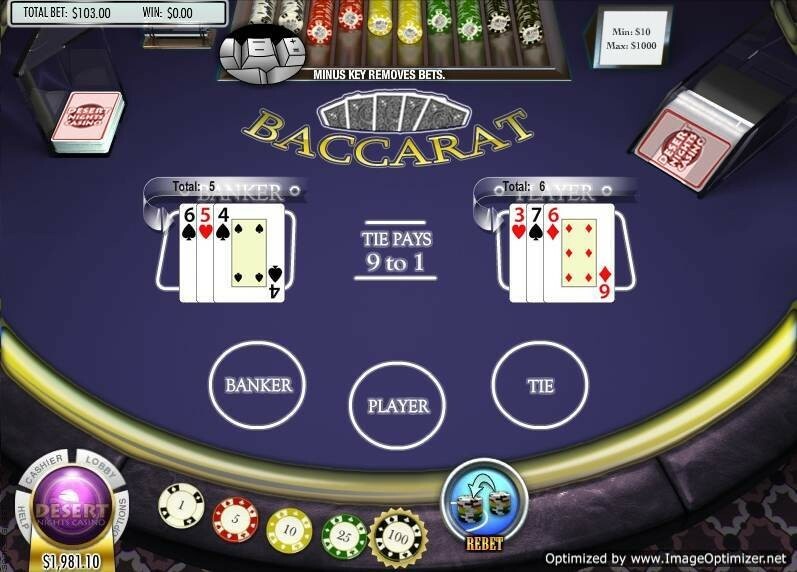 The minimum bet in this Baccarat online game is $1 and there is a max bet of $250. There is max pay out possibility of $2250 if playing the max bet on the tie spot.